Don’t be a victim of hype marketing. What bothers me sometimes about this business(internet network marketing) is people prey on others by making false claims, giving false testimonies. I am not an overnight success. It has taken me years to learn how to make even a little bit of money. What Happens With Consistent Effort And Focus? I say this often but the biggest factor to being successful online is being consistent in action. That is by far the most important thing you can do to build your business online. What happens is when you take consistent action things happen. I don’t know how to explain it other than to say just keep at it, don’t quit. Those of you that read my blog and have been reading my blog know that my results in empower network has been pretty consistent since I joined back in 2011. I share my results and tell my story because for me it’s not just about making money. “YES! Finally a way for someone to make gangster style money… SWEET! 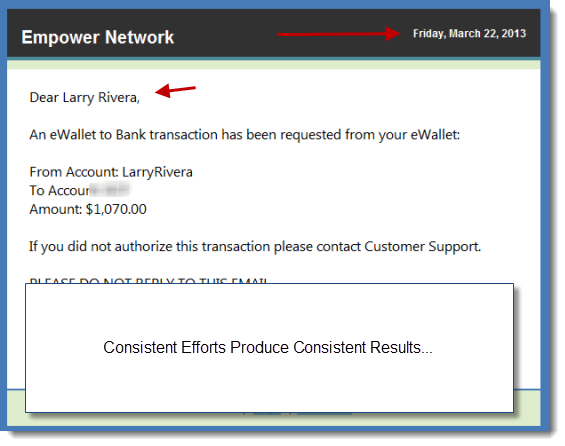 I don’t know how much money you can make with empower network. To be honest people are different some people take the knowledge they get and do nothing with it. Don’t ask me why, but it happens all the time. I advise you to always go into something with you eyes open and know what you are getting involved with. I love empower network because of their vision, community, culture , transparency,integrity. I never thought in a million years I would say something like that. But from my heart it’s true. It actually doesn’t make sense to me why someone wouldn’t want to be involved with empower network.